Sometimes people say that you can’t look good without some good money to spend. Crashing this myth once and for all will be Mongs from My Thrifty Closet. Mongs caught my eye these last few months, as she looks very stylish in her often minimalist but always chic style. So it comes as a complete surprise when she lists her clothes at the bottom as ‘hand me downs’ or ‘thrifted for $2’. It’s clear that Mongs has a good eye for clothes that suit her and has developed her own unique style. I think we can all learn a thing or 2 from her on how to look great on a budget, so I was very pleased that she kindly agreed to an interview. I started the blog because I wanted to share how God inspires me to be creative with hand-me-down and thrifted clothes . My style is simple, functional and uniquely me. Most of the time vintage, occasionlly modern. You call your blog My Thrifty Closet and most of your outfits feature hand me downs and thrifted items. How difficult is to look good on a low budget? I realized that a lot of people abandoned good quality clothes. So it’s actually not difficult to find great stuff at the thrift stores. As for the hand-me-downs that I get from various friends, they are usually clothes that don’t fit them anymore but are still in mint condition. 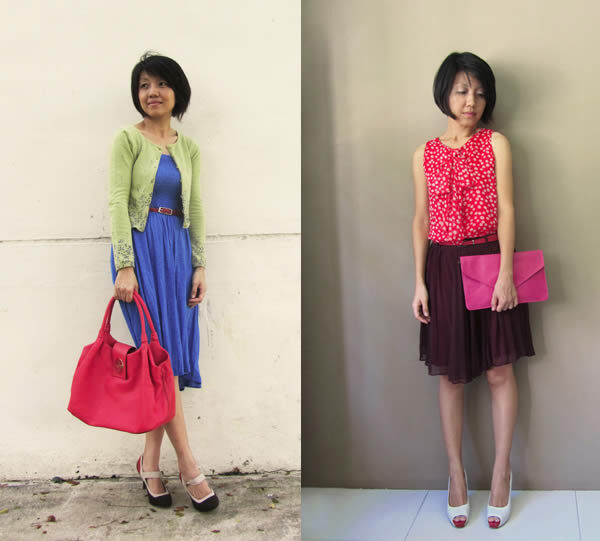 Sometimes, I try to refashion the second hand clothes to suit my style. How do you become a good thrifter? What are the things to look out for? Go to the thrift stores often and look hard. There is always treasure in the mess. And think out of the box. Sometimes changing the buttons or simple alteration can transform a piece of clothing. What items should you avoid in thrift stores? Nothing really. I get hyped up whenever I walk into a thrift store. Is thrifting very time consuming? How much time do you spend doing it? I go to the thrift store at least twice a month. And spend at least one hour at the store each time. For some reason, there is always something cute waiting for me. If you had a lot of money to spend on clothes, would you still thrift? Definitely. Thrifting is my passion. The pieces I get are one of a kind. And I love vintage so I am always looking out for them. Has your style changed much over the years? I think my style is still fundamentally the same except maybe it has improved with age. I have always been interested in fashion. I enjoy dressing up because it ‘s a creative outlet for me. To me, it’s important to look presentable especially when I am meeting someone. But I am not obsessed with the way I look…I have my lazy days when I just leave the house in t- shirt and shorts. I don’t really have a favorite outfit but I like my vintage polka dot skirt. I keep myself updated with the lastest trends. Sometimes I do find thrifted pieces that are on trend. 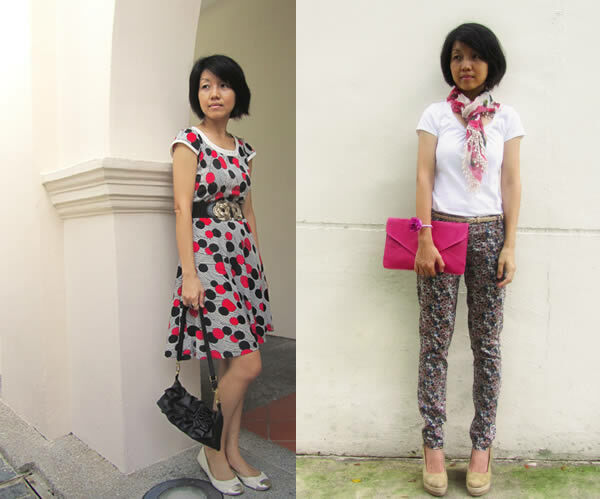 Currently, my favorites are Pastels, florals, and mix of prints. Do you have any other fashion and style tips for women who like to shop on a budget? Choose pieces that are simple and classic, they go a long way and are versatile, just add accessories. I want to blog as long as I can so that I can continue the wonderful friendships with different bloggers from all over the world. I also hope to work on more refashions and DIYs in the future. I think Mongs is a true inspiration on how you can look great with less. 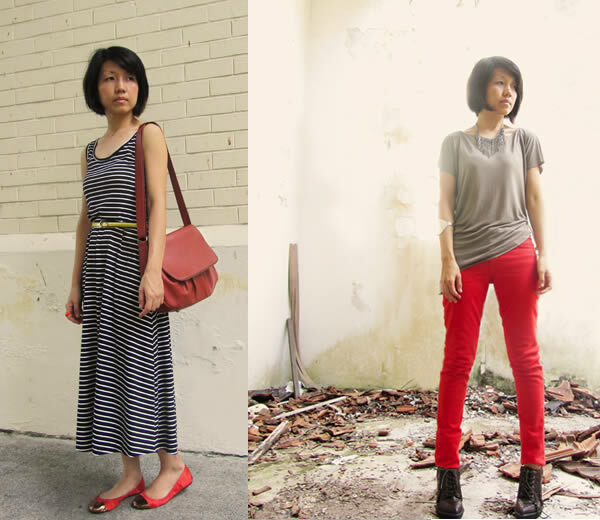 She teaches on her blog how you can refashion your clothes, so that you can reuse items that don’t fit anymore. It’s all about having a good eye and mixing it all up. Thanks Mongs for your wisdom! I agree with Mongs! In today’s world,with the cost of everything! You need to shop around! Great deals can be found at thrift stores or even yard sales. I come from a fairly large family and had to learn early on to shop wisely. Mongs does make it look easy. I guess good thrifting comes with practise and knowing your style and what you want. Luckily when you do make a mistake, it is not so costly…. Lucky you for getting that blazer, sounds great! I am impressed. What a good eye she has. And she is apparently very good in thinking outside the box. I am not, but I am learning. My capsule for Rome last week was my first victory. You are right, your travel capsule for Rome looked great! Wow Mongs has great style! I’m always so impressed with people who have such an eye for finding great pieces at vintage and thrift shops. Me too. I’ve never quite had the patience for it! Hi sylvia thank you very much for this feature. I am so honored! By the way i have learnt a lot of great styling tips from you so thank you too! Thanks Mongs. That’s why blogs are so good. We learn from each other every day! Great Interview! I LOVE Mongs style. She inspired me to start my blog about thrift store finds. I am amazed at what people get rid of and alot of it still has tags! Great to read that Mongs inspired you to start your own blog!